Background: The use of dihydroartemisinin (DHA) for effective malaria treatment is challenged by its poor aqueous solubility and inadequate bioavailability leading to treatment failures and emergence of resistant strains. A review of some novel drug delivery systems developed to address these challenges and their patents revealed that no study has reported the application of surface modified lipid nanoemulsions for improved antimalarial activity of DHA. 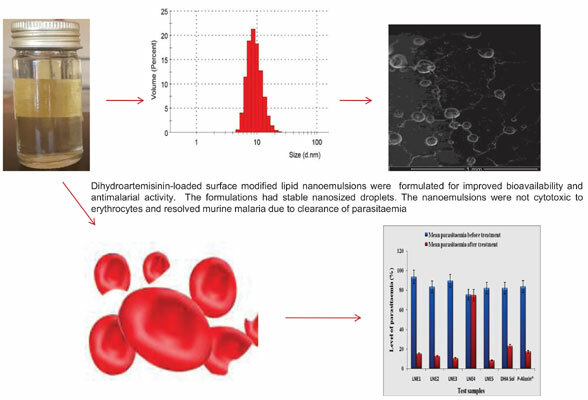 Objective: The main thrust of this study is to develop oral dihydroartemisinin formulations solubilized in surface modified lipid nanoemulsions, characterize, and evaluate their activity against murine malaria. Method: Lipid nanoemulsions containing dihydroartemisinin were formulated by high pressure homogenization using soybean oil, and polyethylene glycol 4000 was employed for surface modification. The formulations were characterized for droplet size, surface charge, pH, fouriertransform infrared spectroscopy, and surface morphology, viscosity and drug content efficiency. In vitro haemolytic study as a function of cytotoxicity using red blood cells as well as in vivo anti-malarial study using murine malaria model was also investigated. Results: Nanoemulsions recorded droplet sizes ranging from 26 – 56 nm, and zeta potential in the range of -28 to -35 mV. The formulations were slightly acidic (pH 4.4 – 5.8) with the drug molecularly dispersed as seen using infrared spectroscopy. The formulations showed non- Newtonian flow with significant drug content efficiency in the range of 77-96%. The formulations did not induce haemolysis of cells and showed good clearance of parasitaemia. Conclusion: Surface-modified lipid nanoemulsion is a perfect carrier system for improving the anti-malarial activity of dihydroartemisinin. Lipid nanoemulsion, dihydroartemisinin, PEG 4000, malaria, parasitaemia, surface modification.